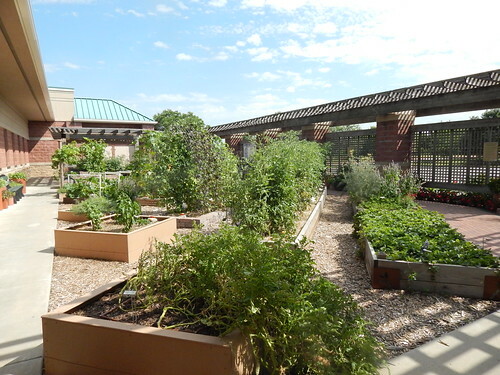 Even though the tomatoes are just starting to ripen, we are beginning to think about fall in the garden! 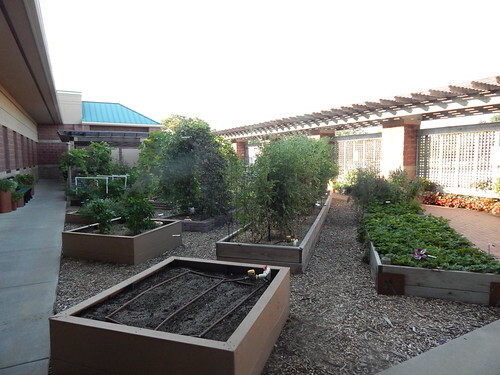 Here’s a before and after look at the garden this week. Can you tell what changed? This is Tuesday before our regular work day. This is Thursday, after the work day. Can you tell what we did? 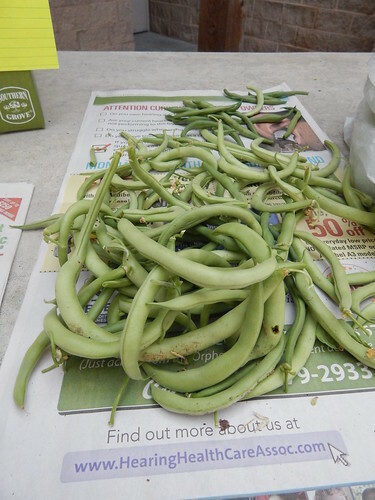 We did harvest the potatoes last week, but this week we removed our spring planted beans because they were full of spider mites and pretty much done. We are planning to replant with different varieties next week for our fall bean crop. We also pulled the pole beans off the trellis, even though they had just started blooming. We will replant the same varieties and see if we get better results this fall. 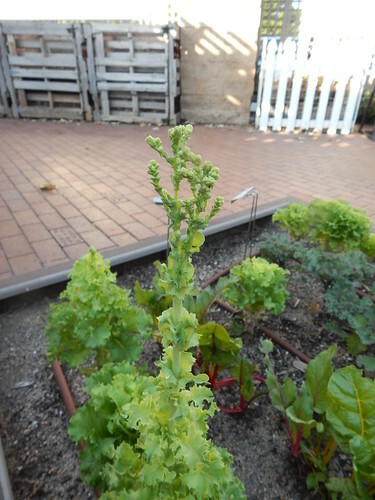 At long last, the ‘Muir’ lettuce finally gave up in the heat of last week! We had been very impressed with the fact that it had not bolted nor gotten bitter yet. This variety should be a great option for us to grow in spring into summer. We will have to try it again another year to see if the results are the same. 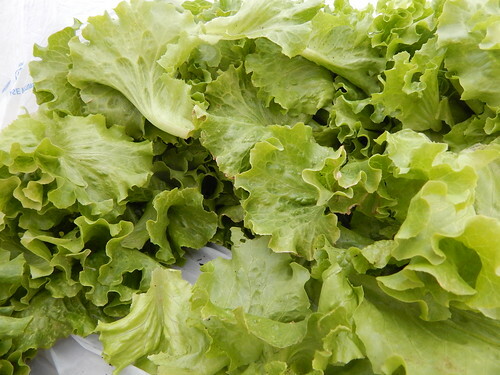 We will be replanting lettuces in the next few weeks. 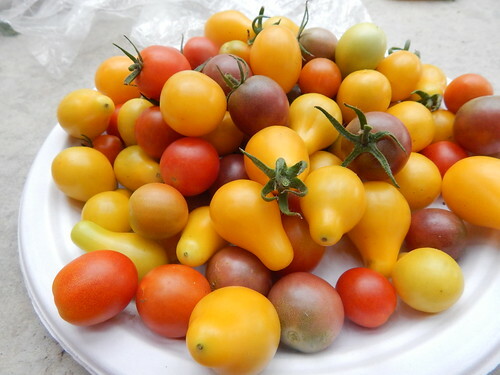 As per usual, the cherry tomatoes are the earliest ripening and most prolific tomatoes in the garden. 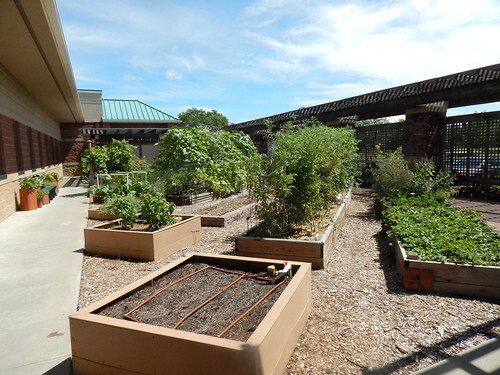 This year we have Sweet Million (red), Chocolate Cherry (purple), and Yellow Pear (yellow) growing in the tiered Accessible Garden beds. One of the delights of growing a range of winter squashes – big, beautiful flowers and attractive leaves! 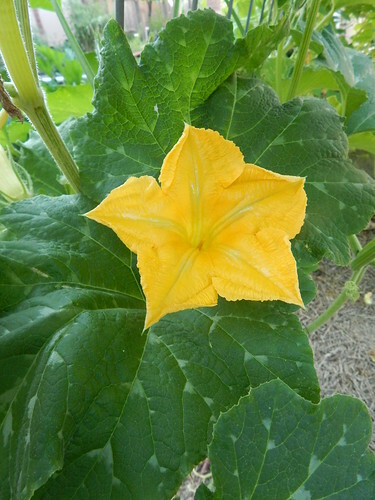 These squash blossoms would be great to pick and stuff with cheese or other fillings. 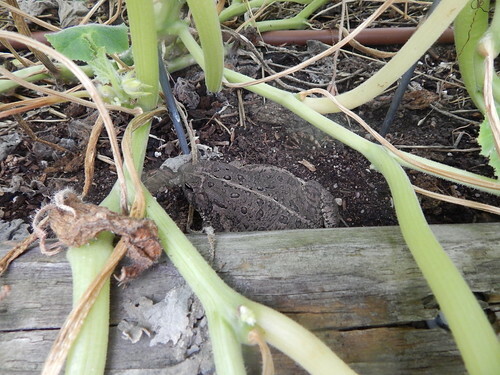 When I was checking our squash stems for signs of vine borers the other day, I noticed this big guy hiding out under the vines. Do you see him? The zucchini have quickly started producing now that the row cover is removed. I guess the row cover was both a successful and failure as an experiment. It definitely prevented the squash vine borers while it was on, but we didn’t get much squash until it was removed. It has been quite some time since I’ve gotten around to posting some recipes on the blog. I wanted to share both some recipes I’ve tried as well as our Saturday Sampler recipes from this year. It wouldn’t be summer without some sort of tomato salad! This simple salad didn’t even have a recipe. 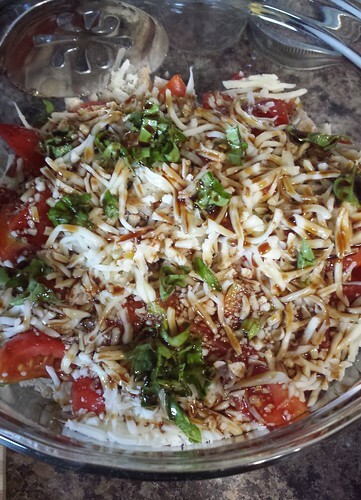 I just sliced up cherry tomatoes, cubed up some lemon-basil bread from the store, added mozzarella cheese, basil, balsamic vinegar, and olive oil. Then I gave it all a mix! Yum! A while back I tried this recipe. Skillet Gnocchi with Chard, White Beans, and Tomatoes. It was a delicious and filling vegetarian meal. 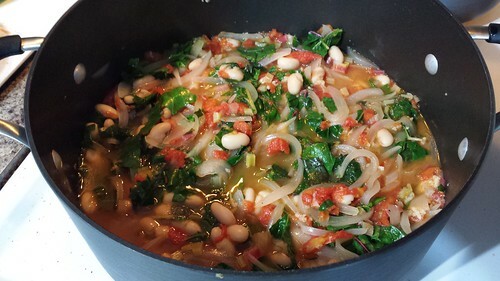 I used some frozen roma tomatoes I had from last year, fresh chard, and canned beans. Yum! 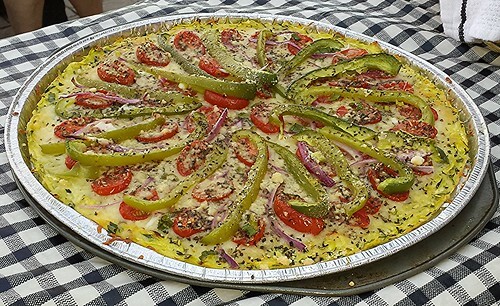 This is another recipe that I just kind of threw together this spring with what I had on hand. 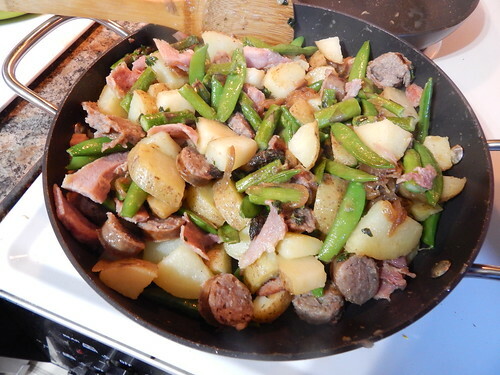 There’s some leftover ham and brats, boiled potatoes (turned fried potatoes), sugar snap peas, asparagus, and some herbs all sauteed in a little bit of oil. Have you tried any delicious recipes with your home grown produce this year? 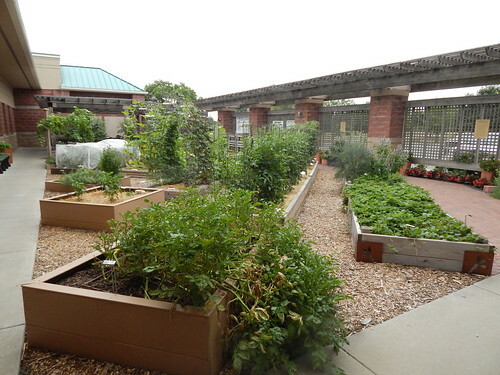 The garden is growing well in the heat, but we are starting to see the effects of the heat. Spider mites are popping up on the beans and tomatoes, the squash are looking a bit scorched, and the strawberries are tiny. Let’s take a look! The garden doesn’t look quite as lush and green as it has some years, but that’s okay. The combination of rain and heat has been challenging, so it isn’t surprising to see things looking a little less than ideal. Most of the tomato varieties are just starting to ripen. This is actually the normal average for ripening here, although the last few years have been such odd tomato years it is hard to keep track. This tomato is one of the new ‘Chef’s Choice Orange’ that we are trying. As you can see, the cracks are problematic. That said, almost all of the varieties we’re growing have some cracks this year. Cracking is a very common problem in Kansas, primarily caused by fluctuating moisture levels and temperature. That pretty much describes this year! The best solution to cracking is to harvest fruits early and let them ripen indoors. Many of the tomato varieties have good fruit set, but I’m particularly impressed with this ‘Italian Gold’ variety, an heirloom roma with golden yellow skin and flesh. The spring planting of beans are starting to show signs of spider mites. 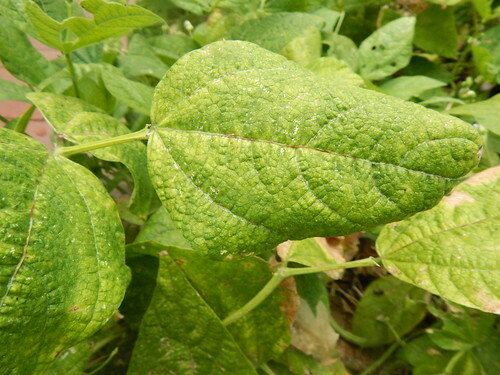 The yellow and white stippling on this leaf is caused by spider mites. While we could try treating, I think that we will probably pull these beans out in a week or two and replant for the fall. After harvesting the pitiful amount of zucchini off these plants on Monday, we decided to leave the row cover off from here on out. (Partly because we didn’t think we could get it back on. 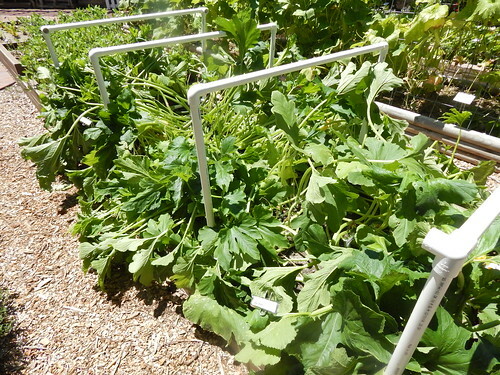 Clearly our design needs some work…) The removal of the row cover has resulted in floppy plants and some sunburn on the leaves, not surprisingly. I expect the plants will improve quickly though. 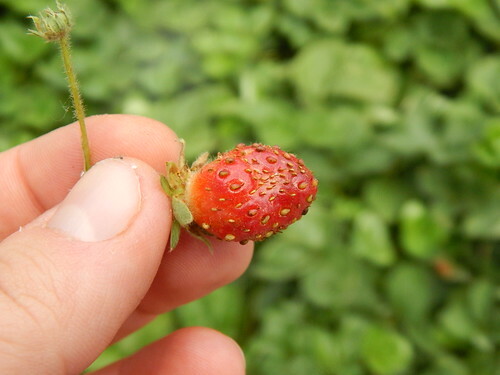 Tiny strawberry! No, they aren’t supposed to be this size, but considering the heat, I’m impressed that there are fruit at all. Everbearing/day neutral strawberries typically will not set fruit at temperatures over 85 degrees. The flavor was nothing to write home about either. It was very sour. 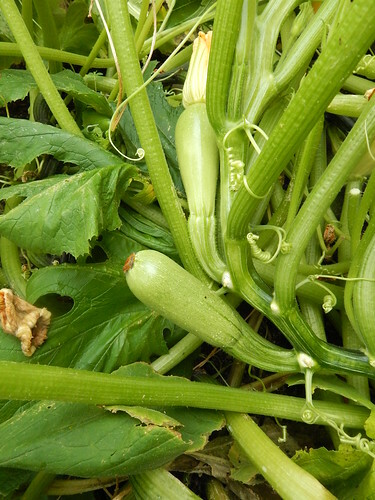 We have Saturday Sampler coming up tomorrow at 9 a.m., featuring summer squash/zucchini. 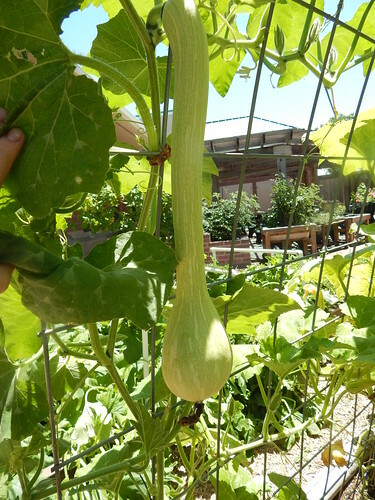 This is one of the ‘Tromboncino’ squash that is supposed to be resistant to squash vine borers. So far, so good on that front! The garden feels like it is still in it’s early summer stages, even though it is now the beginning of July. We’re picking beans and some greens, but not much else yet. The poor potatoes keep falling further over, but they are still pretty green. Most everything else is growing well, although we certainly haven’t reached the jungle-like stage yet. The ‘Muir’ lettuce is the winner so far this year. All the other lettuces have been removed for the summer, but this one is still looking good and really hasn’t gotten too bitter yet. It has a bit of strong flavor to it, but not so strong that it is distasteful. In the bean bed, the best yield so far has come from ‘Contender’ which is one of the old school varieties. It is also the shortest day to maturity variety. We’ll have to see if the other varieties catch up. The ‘Blue Lake Pole’ beans are doing pretty much nothing, while the ‘Carminat’ pole beans are setting a few beans. We have a squash! 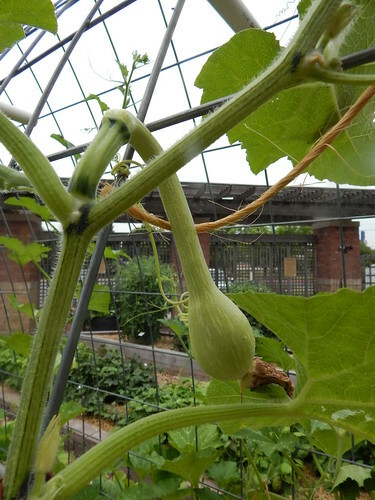 This is one of the ‘Tromboncino’ squash, which is primarily eaten at the immature stage as a zucchini. 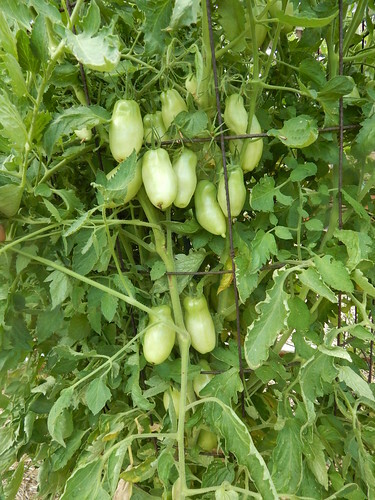 It is growing on one of our trellises, and the plant is still looking pretty good with no signs of insects. It’s the first tomato of the year! 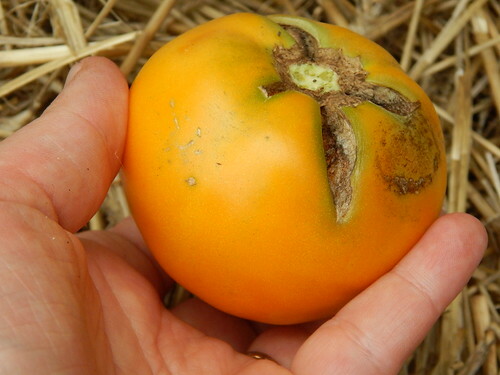 This is one of the ‘Italian Gold’ roma tomatoes. 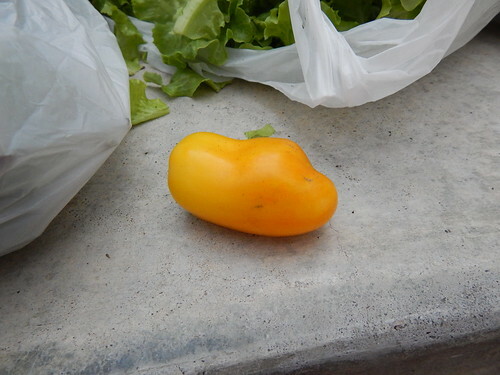 Not sure what’s going on with the weird shape of it, but hey, it’s a tomato. It even appears to have beaten out the cherry tomatoes for earliness! Most of the other plants have some nice sized fruit, but they aren’t all that close to ripening. 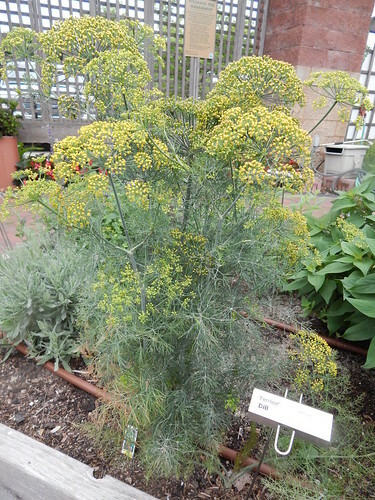 This ‘Fernleaf’ Dill is looking great with some nice clusters of flowers. If we had any cucumbers in the garden, we’d be ready to make dill pickles. But…no cucumbers this year! I suppose we could make dilly green beans if we were so inclined.